The ammonium nitrate market has, of late, been experiencing remarkable growth on account of the ever-growing population that has created an imbalance in the demand & supply of food across the globe. The global population is anticipated to cross 8 billion by 2030, thereby generating a massive requirement for viable sustenance, inviting a spate of disturbance in the demand-supply graph of food production and distribution. In consequence, this will result in a surge in agricultural and farming activities, escalating the usage of fertilizers, and subsequently augmenting the growth of ammonium nitrate market. The demand for fertilizers is quite high in the APAC and Latin American countries due to the expansion of agricultural lands in these nations. Private organizations and government bodies in developing nations like Latin America, Asia-Pacific and Africa, having recognized the acute shortage of food supply, are encouraging farmers and creating awareness programs for the utilization of more fertilizers to improve the agricultural yield. The surging demand for fertilizers in this context will thus drive the growth of ammonium nitrate market in the upcoming years. Speaking of ammonium nitrate, it is prudent to mention that LDAN, known as low-density ammonium nitrate, is utilized as an effective, high quality and cost efficient mining explosive and blasting agent, especially in emulsion type explosives or with ANFO (Ammonium Nitrate/ Fuel Oil). Low-density ammonium nitrate is utilized as porosity control agents and anti-caking coatings. Better known for its longevity, flexibility of usage, and excellent stability, LDAN also depicts excellent sensitivity to shock waves, has free flowing properties, and is renowned for homogeneous & fast absorption of oil. Indeed, the global LDAN market is predicted to showcase a CAGR of more than 4% over 2018-2025. The civil construction industry is predicted to emerge as among the most profitable application avenues for the ammonium nitrate market. Undeniably, this growth could be credited towards the rise in constructions, renovations as well as infrastructure needs around the world. A recently published report suggests that the volume of construction output would be escalating by over 80% to more than US$15 trillion globally by 2030, with three nations – India, China and the U.S. – leading the industry. Ammonium nitrate finds extensive use cases in the civil construction industry for concrete dams, excavation for railways, tunneling, road making, etc. 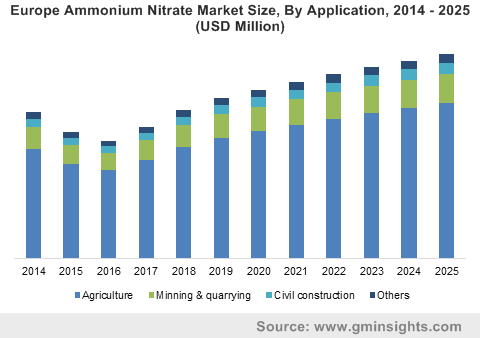 Endowed with a wide spectrum of use cases in the civil construction industry, the ammonium nitrate industry is slated to gain considerable momentum in the years ahead with the massive expansion of the construction sector worldwide. As per reliable reports, the agriculture industry is estimated to showcase a highly commendable growth rate across developing economies such as Latin American and Asia Pacific countries. Indeed, agricultural products, with respect to their price patterns, have depicted a major transformation in the recent years. This demand is expected to significantly grow ahead, owing to a number of key factors, a crucial one being the rising population worldwide. To address the food demands of the escalating populace, governments across the globe have been undertaking major initiatives to bolster the agriculture industry. As the demand graph for food products remains ever-exponential, fertilizers will automatically witness a surge in requirement, which will further catapult the ammonium nitrate market share from agricultural applications over 2018-2025. Endorsed by a broad application terrain, the ammonium nitrate market is expected to showcase a highly profitable growth chart in the coming years. As per estimates, the valuation of ammonium nitrate market would cross a respectable US$23.2 billion by the end of 2025.